It's packed with immunity-boosting ingredients to keep those winter colds at bay. This wintery kale salad is loaded with the right mix of macronutrients—protein, fat and carbohydrates—to keep me satisfied and happy. 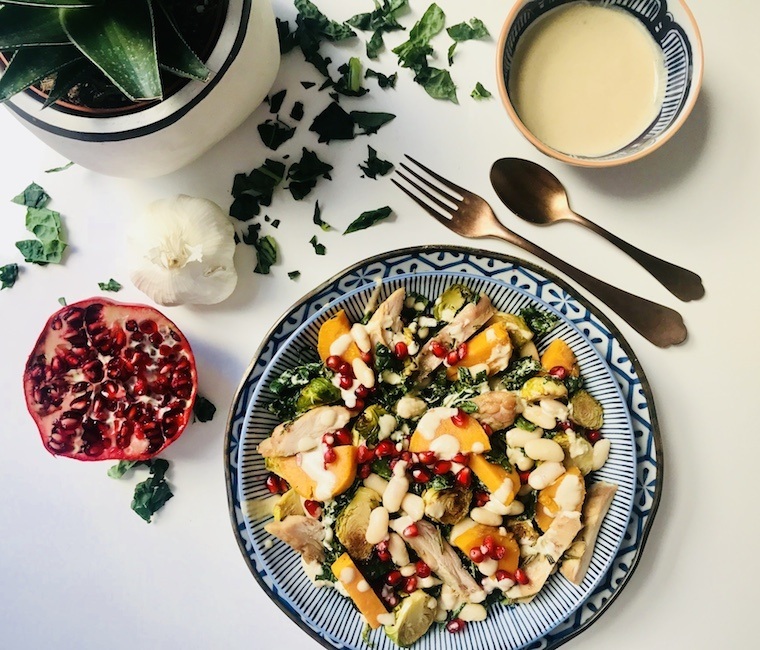 I think of it as a healthier version of a classic chicken Caesar, with a garlicky Tahini-based dressing to add a delicious creaminess. There’s also plenty of vitamins A, B6, and C to bolster your immune system and keep you from getting sick and missing out on all the holiday fun, plus lots of fiber and roughage to keep your blood sugar regulated and digestion moving.Flavor-wise, it’s all about balancing the yin and yang: the sweetness of the roasted potatoes and Brussels sprouts plays off of the savory, garlicky chicken and slightly bitter greens. You can skip the pomegranate arils if you want, but I find they add a pleasing crunch and just a hint of fruity freshness that bring all the recipe components together. 1. In a large Ziploc baggie combine the chicken, half of the chopped garlic, rosemary (reserve a half tablespoon for white beans), and one tablespoon of olive oil. Marinate for at least three hours. 2. Heat oven to 375°F. Place the chicken on a baking sheet and bake until cooked through and lightly browned, about thirty minutes. Remove from oven, set aside. 3. Rinse white beans in water in a colander. In a small bowl, combine the beans with the remaining garlic and a half tablespoon chopped fresh rosemary. Set aside. 4. Bake the sweet potatoes until they are soft, about thirty to forty minutes. 5. On another baking sheet, coated with a half tablespoon of toasted sesame oil, arrange the Brussels sprout halves. Roast until they are soft and lightly browned, about twenty minutes. Season to taste with salt. Set aside. 6. Chop the kale into bite-sized pieces. In a bowl, mix the Tahini, the rest of the sesame oil, and vinegar until fully combined. 7. In a bowl, massage one tablespoon of dressing with one-fourth of the kale. On a plate, assemble the salad: Arrange kale, half of a sweet potato, one-fourth of the can of beans, one-fourth of the Brussels sprouts, two chicken thighs or one breast, and drizzle with another tablespoon of the dressing. Top with pomegranate arils if desired. 8. Keep dressing and the rest of the salad refrigerated in glass containers up to three days.